It is important that we recognize and share every day successes. We encourage that amongst our teams and team members. With that framework in mind, we are proud to highlight a few of our recent recognitions. We are proud to be founding members of the LaundryESP (Laundry Environmental Stewardship Program). LaundryESP’s goals include quantifiable goals for reductions in water, energy, and washroom chemical usage. To implement LaundryESP member, companies will work with the EPA, local water treatment authorities, clients, trade groups, environmental groups, and other stakeholders to ensure its success. Service Linen and MediCleanse received statewide recognition for its environmental leadership by winning the Association of Washington Businesses 2012 Environmental Excellence Award for Environmental Excellence in Resource Conservation. AWB serves as both the state’s chamber of commerce and the manufacturing and technology association. The AWB’s Environmental Excellence Awards Program is a showcase for companies who successfully implement programs that demonstrate initiative in the area of environmental protection. Service Linen and MediCleanse are honored to be one of the businesses leading in this area. We are very proud to be one of the 2012 Washington Green 50 Award Winners chosen by Seattle Business Magazine. The Puget Sound is not just where our business is — it’s also our home and we care about being responsible stewards of this area. We believe in respect for nature and environmentally responsible business practices are at the core of our business. MediCleanse has been inspected and accredited by the Healthcare Laundry Accreditation Council (HLAC). HLAC was created for the purpose of inspecting and accrediting laundries processing healthcare textiles for healthcare facilities. Its mission is to publish high standards for processing healthcare textiles and to provide an inspection and accreditation process that recognizes those laundries meeting or exceeding these standards. This insures that our clients can expect a consistent and smooth flow of hygienically clean textiles. 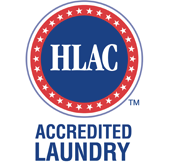 An HLAC-accredited laundry has proven itself as a premier company to partner with.